Nimrod Long and Associates (NLA) provided landscape architectural design services for a large, multi-floor office building in downtown Birmingham, AL. The firm’s work included hardscape design as well as landscape design for the large city block streetscape. Design features included a beautiful wall of water fountain with multiple panels of verdant green foliage on either side of the water wall, distinctive brick sidewalks, a dining plaza for two ground floor restaurants, decorative lighting, and street trees. 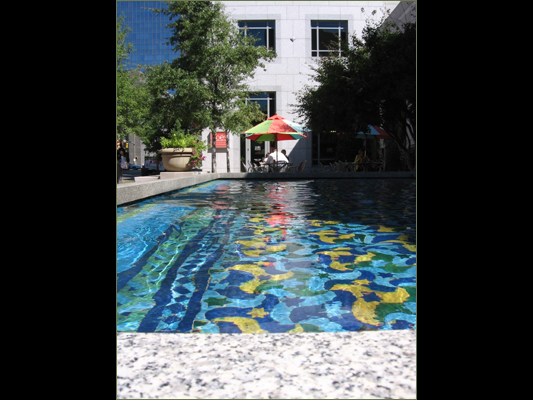 A gift from the country of Morocco to the City of Birmingham led to a custom designed pool at the foot of the water wall using hand made Moroccan tile. NLA selected the colorful tile pattern, coordinated its delivery from Morocco to Birmingham, and provided oversight for the installation of the tile.